From the late 1980s commercial Dynamic Light Scattering (DLS) detectors started being used in commercial biophysical laboratories throughout the world. These instruments enabled size measurements of small volumes of proteins and other biomaterials in solution to be made, with small sample volumes and in relatively low concentration ranges. The ability to make these measurements in a relatively straightforward way, or in any case with complete recovery of the sample, soon made these instruments very popular. This is particularly true in protein studies where DLS instruments were used to screen proteins to predict if the protein was likely to crystallize before such a lengthy procedure was carried out. Other issues, such as stability, aggregation, complex formation and conformation in bio-molecular research were also studied using these instruments. Nevertheless, early versions of these instruments were beset with problems of reliability, reproducibility, contamination, poor software and a lack of understanding of the instrument limitations. As the instrument optics, lasers and software improved so did the reliance put on this technique. This resulted in the situation where the industry leading DLS instruments equipped with cuvettes can now be found in most of the world’s biophysical characterization laboratories. Nevertheless still today always multiple measurements on one sample must be done due to valid statistics. And filling and eventually cleaning of the cuvette involved is labor intensive work. For more than 30 years, conventional dynamic light scattering measurements have been performed in the same, mind-numbing and labor-intensive way: standing or sitting next to an instrument for hours, manually measuring one sample after another in a single cuvette. The DynaPro Plate Reader was developed to address the growing need for rapid, automated and reliable dynamic light scattering measurements. With the emergence of microarray technology for drug research and discovery it became necessary to develop equally rapid screening methods. The idea to utilize disposable standard 96, 384 and 1536 well plates had been applied to other detection methods before, such as UV and fluorescence assays, but no one had ever implemented it in a DLS instrument. Indeed can automated dynamic light scattering be compared with HPLC systems equipped with autosamplers while the cuvette based technology compares to manual sample injection system. Dynamic light scattering is also known as Quasi-Elastic Light Scattering (QELS) or Photo Correlation Spectrocopy (PCS). It works by measuring the intensity of light scattered by the molecules in the sample as a function of time. When light is scattered by a molecule or particle some of the incident light is scattered. If the molecule was stationary then the amount of light scattered would be a constant. 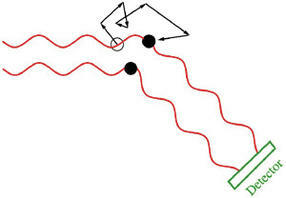 However, since all molecules in solution diffuse with Brownian motion in relation to the detector there will be interference (constructive or destructive) which causes a change in light intensity (see Figure 1a and 1b). 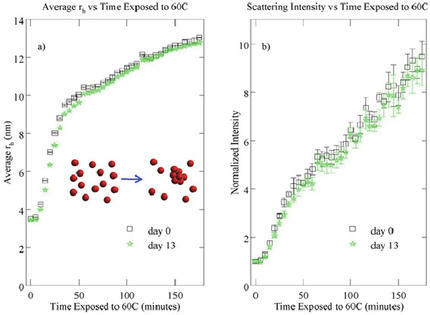 By measuring the time scale of light intensity fluctuations, DLS can provide information regarding the average size, size distribution, and polydispersity of molecules and particles in solution. The faster the particles diffuse, the faster the intensity will change (if the light was bright enough this would be seen as a twinkling effect). The speed of these changes is thus directly related to the motion of the molecule. If the temperature and solvent are constant and known, the variation in the intensity of the scattered light is directly related to the “size” of the molecule. This number is referred to as the hydrodynamic radius, Rh (see later). The random pattern of light intensity changes into an Rh measurement by comparing the changes as a function of time. Thus two plots of the same data are essentially overlayed but with a small time delay between them. The correlation between the first and second plot is then noted. This correlation is then calculated for ever increasing time periods until no correlation is present (ie the changes in intensity are random in respect to each other). 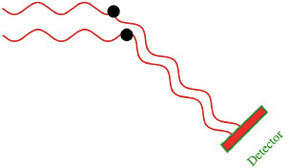 The faster the molecules are moving, the quicker the correlation becomes zero. Once the correlation function has been plotted (normally on a log scale time base) this is converted into a size measurement by drawing in all the other factors that affect the signal such as the temperature, solvent viscosity, laser wavelength as well as the Rh. This process becomes more complex when more than one size material is present. This results in a correlation function that is essentially a mix of the functions from each species present but strongly biased towards the bigger species (the larger the molecule the greater the scatter). It is possible to derive the individual correlation functions but there are an almost infinite number of ways of arriving at the final function unless some assumptions are made for the distribution of material. The mathematical impasse is overcome by assuming that either the distribution is monomodal (i.e. only one species is present) or that if more than one species is present the distribution of each of these obeys certain limits. Good DLS software will allow both of these results to be displayed. The theoretical limit of this technique is that species of less than 40% difference in size cannot be resolved. However, in practice a factor of 2-3x can be required. If full resolution is necessary the sample must be physically separated by centrifugation, filtration, HPLC or Field Flow Fractionation techniques. The hydrodynamic radius is the sphere defined by the molecule rotating in all directions plus the hydration layer, modified by how easy it is to pass the solvent through that volume. It is actually a measure of how easy it is to move the molecule through the solvent. The DynaPro Plate Reader is the only DLS instrument on the market that screens samples directly in microwell plates. All standard plates for optical plate readers (like UV) can be used. 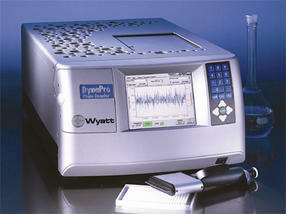 The DynaPro Plate Reader works with 96, 384, and 1536 well plates with normal or low volume design. There is no sample transfer needed which makes it a truly non-invasive, non-perturbing experiment. Cross-contamination due to using the same cuvette for multiple samples or transferring samples is eliminated. Sample measurements can be completely automated which makes measurements of several aliquots of the same sample, formulation buffers and repeat measurements scientific reasonable and economic reasonable. The samples can be easily recovered or the plate can be used for further screening. The industry standard microwell plates are disposable and so there is no need for cleaning the optical cell and the associated need for suitable wash liquids. At the same time, it has the same sensitivity and the flexibility to act as a conventional DLS system – the user simply decides which mode the measurements should be performed in. Moreover, sample analysis using the DynaPro Plate Reader allows the use of different amounts of sample: besides the standard volumina of 50, 20, or 5µL, as few as 1.5 µL (oil coated) can be analyzed. The volume required per well depends upon the plate. For a 96 well plate standard format a minimum volume of 100 µL sample solution is used. For measurements using a 384 low volume plate design a minimum volume of 15 µL per well is used. Using 1536 well plates measurements with volume as low as 1.5 µL are done. 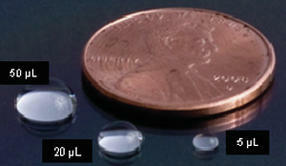 Figure 7: Tiny droplets illustrate the small sample volumes used for automated DLS measurements. Batch Dynamic Light Scattering is a complementary biophysical tool to separation techniques such as SEC, AUC and FFF. Compared to separation methods, DLS measurements with the Plate Reader can be done in seconds to minutes: a 96 well plate can be easily screened in an hour or less, whereas the same number of samples in SEC would require more than 2 days worth of measurements. Another unique advantage of the instrument is that it is a non perturbing technique without interactions with any separation matrix or dilution. Thus, the aggregation state of a molecule can be detected accurately, which is imperative when looking at reversible aggregation. Additionally, the sample is easily recoverable or the microwell plate can be directly used for further analysis. The DynaPro Plate Reader is suitable for any application where molecular size, stability and aggregation are of interest. 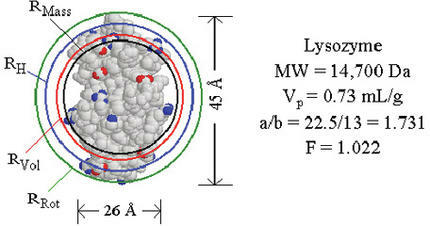 Applications include: characterizing proteins for size, homogeneity, aggregates, and thermal stability over a wide range of formulation conditions; measuring the stability and size of liposomes, viral particles and drug delivery particles; determining aggregation constants and kinetics; optimizing protein crystallization conditions; monitoring folding of proteins and nucleic acids; and detecting and analyzing compound aggregates. Fig. 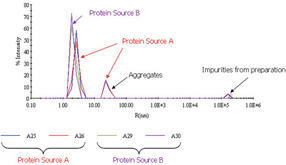 8: Protein measurement using the DynaPro Plate Reader: Comparison of sources A and B in pH 5 buffer. Note the perfect well-to-well reproducibility of the measurements. Protein drugs – especially antibody preparations – are widely used as therapeutic agents. Many of them are physicochemically unstable and prone to dimerization and aggregate formation. This raises new challenges for quality control and analysis. The following example shows a comparison of proteins derived from different sources (A and B) focusing on the detection of aggregates. Whereas protein from Source B does not have any aggregates in the nanometer size range, source A reveals a noticeable fraction of aggregates. Figure 9: Treatment of BSA with high temperature leads to increasing aggregate formation. 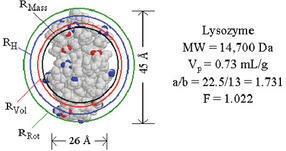 The following measurements principally demonstrate the problem of aggregate formation, which is relevant for every scientist working with proteins. Bovine serum albumin (BSA) is subjected to heat (60°C for up to 3 hours). It appears that this treatment exerts a time-dependent impact on the protein, which results in aggregate formation. This is indicated by an increase in average particle size (a) and accordingly in scattered light intensity (b). To entirely describe the convenience of automated DLS it should be mentioned that the total measurement time of the 108 samples presented here was only 50 minutes. Figure10: The graph clearly shows that the intensity reading from the mixture sharply increases after 0.2mM TX100 and there is a good size measurement by 0.3mM. Taking further readings between 0.2 and 0.3mM narrows the start of the micelle formation down to 0.27mM. The recent interest in micelles and liposomes for carrying other materials (especially drug delivery systems) has made the study of these materials highly relevant to many research areas. The nature of the particles formed (size, range of sizes etc) can obviously be studied but more fundamental characteristics are also open to analysis. Using the Plate Reader, important parameters of micelle formation can be determined, such as the critical micelle concentration (CMC). The CMC is defined as the concentration of surfactants (added to the solution) above which micelles are formed spontaneously. As the surface coverage by the surfactant increases, the surface free energy (surface tension) decreases, and the aggregation into micelles starts. This process again reduces the system’s free energy by decreasing the contact area of hydrophobic parts of the surfactant with water. 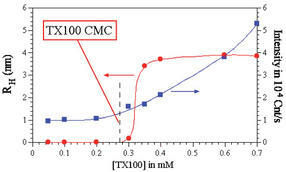 After the CMC is reached, further addition of surfactant will usually increase the number of micelles. Figure 10 below shows the DynaPro DLS (Wyatt Technology) intensity and size trace of a sample of Triton X-100 at different concentrations. DLS analysis is a widely applied, non-invasive method for measuring the effective size of molecules in solution. This technique yields valuable information for the characterization of molecules and particles. It facilitates formerly laborious and time consuming measurements, e.g. screening for aggregates or determining optimal crystallization conditions for proteins. The Wyatt Plate Reader is the instrument of choice for any application where molecular size, stability and aggregation are of interest. It reads industry standard microplates with up to 1536 samples automatically and temperature-controlled, if desired. The applications of the technique are wide ranging and include many of the fastest growing areas of research – proteins, biomaterials, liposomes and micelles as well as the established uses for particle sizing and aggregation detection. Conscious of the numerous characterization challenges in the area of drug delivery systems and therapeutic antibodies as well as protein crystallization or particle analysis, the fields of application of automated DLS are countless. 8Which ICP-OES Optical Technology Offers Superior Performance: Echelle or ORCA? 9Is Your XRF-Analyzer Still Up-To-Date?